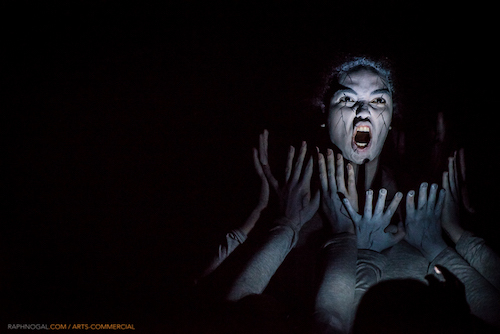 The Skriker, by Caryl Churchill is no easy undertaking. In fact, I would suggest anyone who isn’t familiar with the play or playwright do a little research before attending, to get a better grasp of what you are about to see. It’s a dark and magical play that blends themes of love, revenge and loss. It’s surprising that freshly trained actors at The Randolph Academy for the Performing Arts would be given the task of making sense of a very intense, imagery-driven script. I have to say, I was pleasantly surprised by their grasp of the text. There were some things that I really enjoyed off the bat. I appreciated being introduced to the cast of characters in the ensemble that were to appear throughout the piece. They ranged from grisly and ethereal to monstrous and human and they all had their own unique quirks and fascinations. They were used in a Greek chorus format and added movement, song and vocalizations throughout. They also moved the set pieces lyrically that were essential to the imagery created in the play. The two leads Josie, played by Carol Huska, and Lily, played by Sarah Stewart, did an excellent job at balancing one another. While Josie struggles with the aftermath of aborting her baby, Lily deals with her pregnancy and subsequent birth of her child. I think both of these young women had a lot of strengths as performers and played very well off of each other. One of my favorite performers in the ensemble was Kaitlyn Fall as “Dead Child”. Every time she would appear, eerily singing her song of demise, she would chill me right down to the core. I found her character utterly disturbing. Taylor Shouldice as “Rawheadandbloodybones” also caught my eye. I had deep empathy for her character, even though she supposedly has a “taste for suffering”, and was completely intrigued every time she would make her way onto the stage. She reminded me of an overactive nervous system. Jittery and staccato in her movement. I also have to make note of the technical crew. They did an amazing job at nailing all the quick lighting, sound, music and projection cues which even included a live drummer. They were fabulously tapped into the production and were a lively and present entity in the room, as if they were another cast member. There were however, moments where I was a bit distracted by heavy activity on one side of the stage while dialogue was happening on the other. Perhaps that was what was intended but I kept forcing myself to tune out one side to listen to the other. For the most part, I enjoyed watching this show. It was spectacular and had something going on in every nook and cranny. Even though my companion thought this piece shouldn’t have necessarily been performed by students at this level, there is no disputing that a lot of work went into it. I can see how this may be a valuable challenge and piece for students to sink their teeth into. It’s worth seeing the work of actors who are multi-talented and get to show it. Also, they rotate casts which is pretty cool. It might be a totally different experience on another night. General Admission tickets: $22 and can be purchased online in advance, or at the door. Thanks for the shout out to my daughter Kaitlyn,she is amazing at everything she does,she has had raw talent since birth.